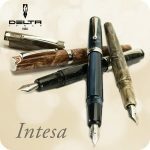 New collection of writing instruments by Delta. It is made in acrylic resin turned by hand from a single barrel. It is available as fountain pen cartridge/converter system, roller with screwable cap and twist ballpoint. Each instrument is offered in four brilliant colors: grey/black marble, blu, horn and brown. Each one offers a different and unique shade that makes it very exclusive! This new collection of fountain pens, created in partnership with Delta, stems from one of my dearest wishes: bring together pen lovers and the most noble material in the history of writing instruments; the celluloid. 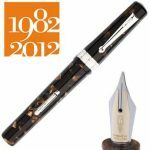 Who among the pen enthusiasts has never dreamed of owning one? Today the difficulties of acquiring, storing and processing Celluloid makes it all the more expensive and exclusive. To achieve this fantasy of mine I turned to the only company with passion, patience and ability to translate these wishes into reality: the master crafsmen of Delta. With all the vast expertise and knowledge these aritisans gave birth to the first Corsani project: Fantasia Vintage! 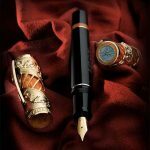 It is a collection of fountain pens sober,elegant and very limited. The beautiful selected colors, emphasized by the warm iridiscent tones that only the organic nature of celluloid can offer, create an emotion that evokes a past never forgotten. 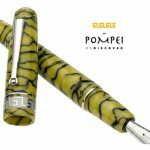 For all those seeking exclusivity, for those who take comfort and pleasure writing rather than testing or just only for those who love the contact with an object made by hand according to the dictates of the best Italian crafsmanship tradition ! All the writing instruments of the Fantasia Vintage collection are turned by hand from solid bars of special celluloid in six different shades enhanced by white rhodium plated or 18kt gold trimmings. Fantasia Vintage is offered exclusively as a fountain pen with steel nib and features Delta's unique filling system, the “converter plus” that allows to fill the pen from the bottom simulating a piston. For those who would like to have a 14kt solid gold € 595,00. The central ring offers engraved representation of the charming and historic pattern, Greek Roman, obtained by the ancient goldsmith “lost wax” technique. Limited and numbered edition of 25 pieces per color : brown ( the only one with champagne gold trimmings), red/blue, turquoise, dark green, light green and bordeaux. 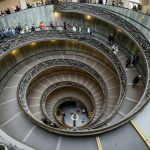 Dolcevita Masterpiece,this is the new and exciting issue by Delta. 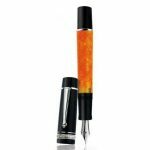 It has got all the features of the classic iconic Dolcevita but the new resin contains the two main colors (orange and black) mixed inna fluent natural way that makes each pen unique. 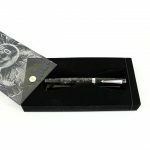 The collection is made as usual in acrilic resin hand turned from solid bars and it is available as roller with cap, twist ballpoint and fountain pen with cartridge/converter filling and fusion nib. 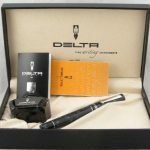 Pen in a limited series of the Delta. 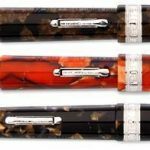 The note Neapolitan house celebrates its 30th anniversary with a limited edition of 100 pieces per color mottled celluloid. 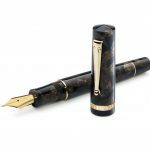 The loading of the pen is a side lever, a system used in the 40s and revived in particular by Delta.Per this series Delta offers the new nib Fusion precisely characterized by the fusion of steel de 18kt gold. 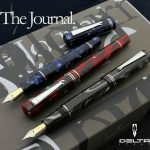 Successful Delta collection of pens “Journal”. Multicoloured acrilic resin turned by hand as in the best Delta tradition.Available in 4 rich marbled shades: blu, red, horn and black. 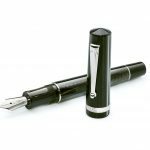 The fountain pen filling system is cartride and converter but it is a special longer converter that allows to fill the pen from the bottom like a piston. Available as rollerball and twist ballpoint too. The true icon of the Delta: the turtleneck of which the maximum expression is undoubtedly the Turtleneck plunger. Made as a whole collection of high-quality acrylic resin orange hand turned from full bar. Details in rhodium silver, 14kt gold nib. Timeless elegance!